Science National Honors Society once again hosted their annual Science Night on Thursday, March 21. 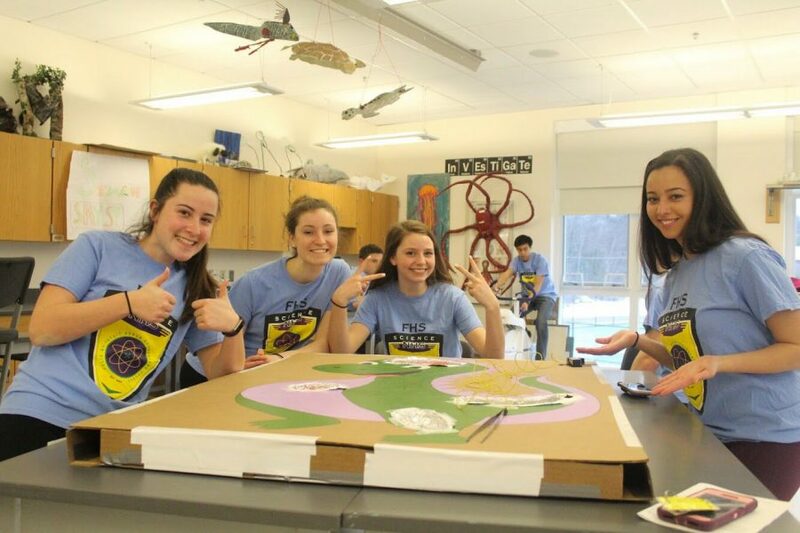 This year, Science NHS decided on making their theme perfectly prehistoric: Dinosaurs. Kids ranging from all ages were greeted with a wide variety of topics to learn about. Each room had a specified scientific field, with activities and games prepared by the Science NHS students themselves. The kids in attendance could explore in Chemistry or Environmental Science, play games in Computer Science and Anatomy, and learn new skills in rooms like Forensics or Physics. The excitement carried from the classrooms to the hallways, as kids pulled their parents in tow and excitedly ran from room to room. A fully grown dinosaur roamed the halls and took pictures, had laughs, and happily gave out high-fives the entire night. In short, the night was a success for Science NHS. Members had been planning this event since the beginning of the year. For one Thursday every month, students were split up into their specific fields of focus; they then split up into even smaller groups, planning individual activities, visuals, or games for the kids to do or learn from.